I have traveled the world all my life, and I have always viewed American Embassies as places welcoming to its citizens and to others and presenting an image of a free democratic people to the world. It is immensely sad to know that is no longer necessarily true. In 2009, Pakistanis learned that about half of the $1.9 billion in aid appropriated by the U.S. Congress was going to be used to build facilities for the Americans to live and work. How must that play into what the Pakistanis think of Americans and their motives? All across the world we are building over large, massively secure embassies and facilities that suggest images not of an open democracy but of a frightened, authoritarian regime. Of course, in the post-9/11 world, security must have a high priority. But in the State Department, it is the security officials who have the crucial say. If those officials oversaw the White House, there would be a 20-foot wall around 1600 Pennsylvania Ave. and a ring of tanks. The White House, in fact, is the best example of how you can have superb security and yet not create fortresses. 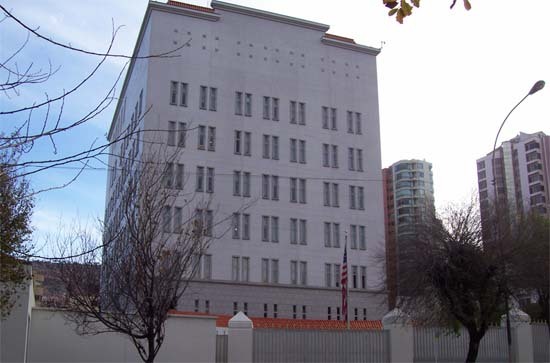 Caption: The US Embassy in Bolivia. I am spending time this summer in Belgrade, Serbia with my wife, Vesna, who was born in the Eastern European country. Last week we decided to visit Kosovo, a region that the Orthodox Serbs see as their Jerusalem. There are only a few protected enclaves of Serbs left in Kosovo. The Muslim majority claim that if the land that was once part of the former Yugoslavia becomes fully independent, the Serbian rights will be protected. I wanted to see how likely that was and how the Serbs live there today. As soon as we said we were going, my wife's family and friends began imploring us not to go saying that we were risking our lives. I felt that there was no great danger, but I figured I should contact the American Embassy and ask their opinion and tell them we were going. Monday morning I called and got a recorded voice. When I pressed "1" saying that I was an American, I got another recording voice saying that nobody was available and that I should leave a message. I found that strange. What if I had been a victim of a crime or had become seriously ill and needed immediate help? I didn't leave a message but tried again in the afternoon, with the same results. I tried twice more Tuesday with no luck. Wednesday I got through and asked to speak to someone in the press office. That led to another recorded voice asking me to leave a message. I said that I was a journalist and would appreciate a call back. When nobody called by Thursday, I called the press office again and left a second message. When nobody called by Friday morning, I called and left a third message, this time a rather irate one. Nobody called back. Friday I happened to be walking on Kneza Milosa, the most elegant street in Serbia lined with impressive government buildings and embassies. Although this visage is marred by the wreckage of several buildings bombed by the Americans in the 1999 war, the most unsettling thing on the street is the American Embassy. There are massive concrete barriers in the street and sidewalk in front of a building that looks like a modern maximum security prison. There is a barrier in the small road that runs next to the embassy and a guard post to raise and lower the steel. It is as unfriendly and uninviting an embassy as it would be possible to construct. I thought to myself as I walked by that if I worked in that building I wouldn't be returning phone calls either. Right after the war against Serbia, I can see why American diplomats would have needed special security but that was over a decade ago, and Americans are welcomed in Belgrade more heartily than they are in Paris. This summer, the Serbian capital is the place to be and young people have descended upon the city from all over Europe to enjoy the spirited nightlife. That evening, the United States played Ghana in the World Cup, and the hundreds of cafes were filled, and most people were cheering the Americans. It isn't just Belgrade where there are problems with our embassies. I spent last summer in Nepal, where I was a Peace Corps volunteer in the 1960s. Then, when I was in Kathmandu, I would ride a bike past a humongous Rana palace, built by the hereditary rulers of the Himalayan kingdom. It was about a block long and was part of the cultural patrimony of the Nepalese people. A number of years ago the Americans bought the palace, tore it down, and, in the middle of the capital of one of the poorest countries in the world, put up enormous walls. Inside they built an embassy, including offices, a baseball field, a big swimming pool, tennis courts, and the American club. At the height of the British Raj, the English did not live as completely separated from the Indian populace as the Americans live today in Nepal. In Iraq, where we say we have no intention of staying permanently, we have built within the Green Zone the biggest embassy in the world, a 21-building complex on 104 acres. In Pakistan, we are building another super embassy. In 2009, Pakistanis learned that about half of the $1.9 billion in aid appropriated by the U.S. Congress was going to be used to build facilities for the Americans to live and work. How must that play into what the Pakistanis think of Americans and their motives? All across the world we are building over large, massively secure embassies and facilities that suggest images not of an open democracy but of a frightened, authoritarian regime. Of course, in the post-9/11 world, security must have a high priority. But in the State Department, it is the security officials who have the crucial say. If those officials oversaw the White House, there would be a 20-foot wall around 1600 Pennsylvania Ave. and a ring of tanks. The White House, in fact, is the best example of how you can have superb security and yet not create fortresses. We are leaving now for Kosovo, and I know if there is a problem, I should forget calling our embassy. I have traveled the world all my life, and I have always viewed American Embassies as places welcoming to its citizens and to others and presenting an image of a free democratic people to the world. It is immensely sad to know that is no longer necessarily true. Laurence Leamer is considered a leading authority on the Kennedy family for his trilogy "The Kennedy Women," "The Kennedy Men," and "Sons of Camelot." He also has written best-selling biographies of Johnny Carson, the Reagan family, and Arnold Schwarzenegger. His latest work is "Madness Under the Royal Palms: Love and Death Behind the Gates of Palm Beach." 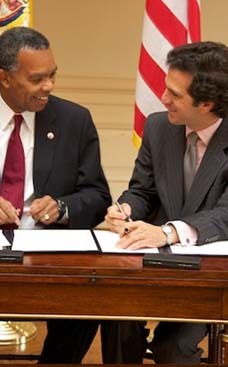 "We will double the size of the Peace Corps by its 50th anniversary in 2011. And we'll reach out to other nations to engage their young people in similar programs, so that we work side by side to take on the common challenges that confront all humanity," said Barack Obama during his campaign. Returned Volunteers rally and and march to the White House to support a bold new Peace Corps for a new age. 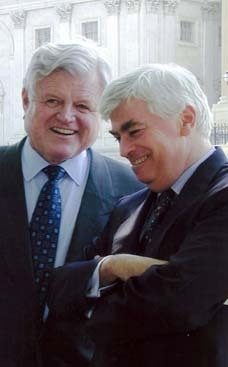 Latest: Senator Dodd introduces Peace Corps Improvement and Expansion Act of 2009 . I was a Peace Corps Volunteer in Panama '65-'67. I returned with a group of middle schoolers on an ecology trip in 1994. It was very unsettling to see metal cross bars ringing the U.S. Embassy. I was embarassed. Later, I returned in 2004. The Embassy was still ringed by a metal barrier, but the State Department was moving the whole operation to what used to be the zone. I didn't see the new place, but a friend who worked for the State Department said that people looking for visas had to stand in the sun for hours since there was no protected place for them to wait. I do hope that has been rectified.